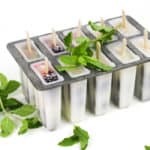 Mojito Jell-O Shots are the cutest way to enjoy the classic rum cocktail in bite-size form! Make a batch for a day by the pool or for a bachelorette party! Everyone will love them. It has been way too long since I posted a Jell-O shot recipe. Ever since making Champagne Jell-O Shots and Baby Guinness Jell-O Shots, I’ve become weirdly enamored with Jell-O shots. They’re way more fun when you make them from scratch, without the weird bright-colored brand name gelatins you find at the grocery store. 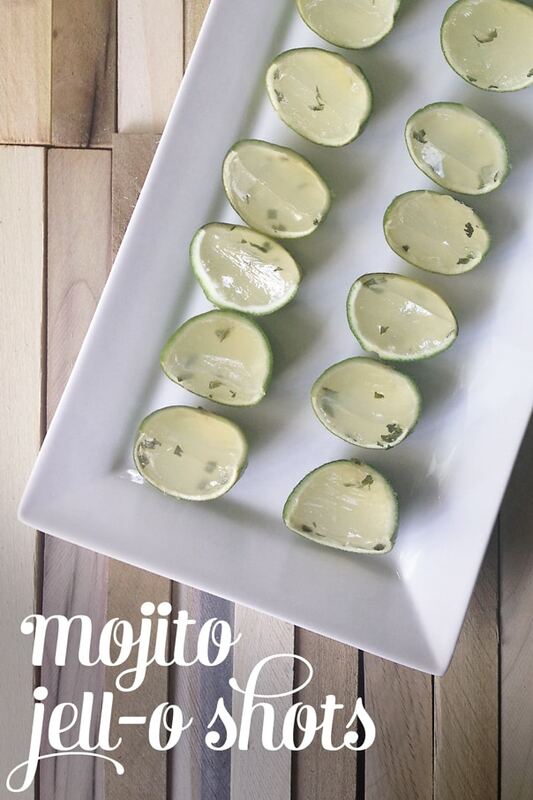 I made these Mojito Jell-O Shots for my friend’s bachelorette party earlier this month. My friend, the bride, always orders a mojito whenever we go out. 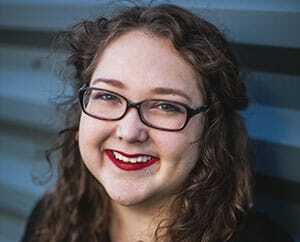 She loves rum drinks in general, but especially the tart, fresh, sweet mojito. So in her honor, I created these alcoholic treats for us to enjoy together with friends, and they were a big hit. Minty and slightly sour with a bit of alcohol, these puppies are a delightful party treat. 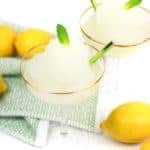 To make these, you’ll need lime juice, mint, sugar, rum and gelatin. You’ll need a stove and a bit of patience. 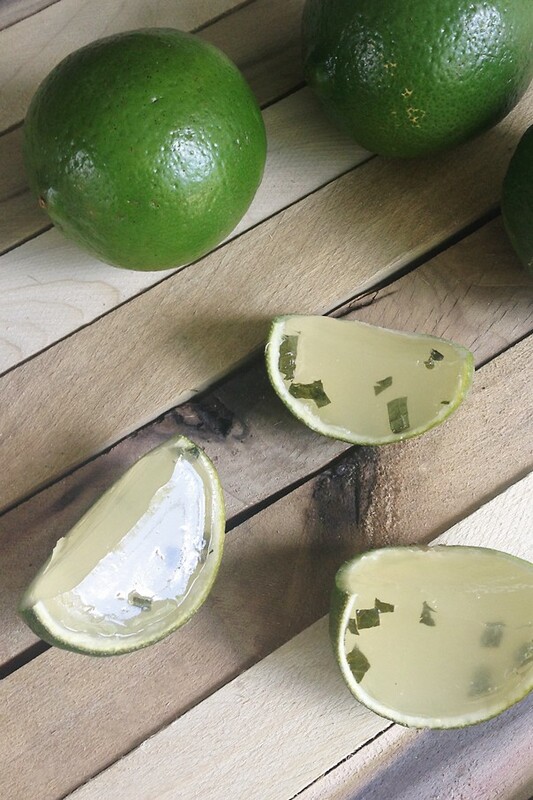 The hardest part is shelling the limes so you can pour the lime juice into them. Or, you can skip the lime shell part entirely and just make these in regular ol’ plastic shot glasses. For the record, you can totally make any kind of Jell-O shot without the alcohol. Not a bad idea if you’ll have kids around when you make them. 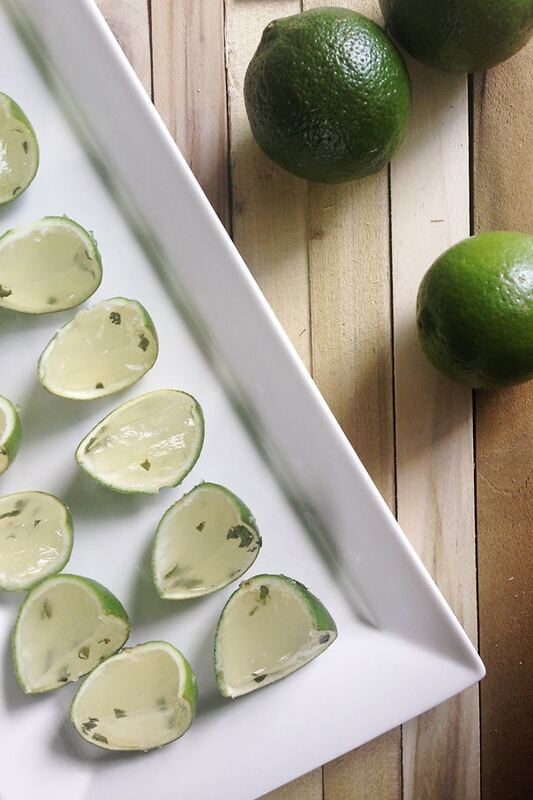 Pin these Mojito Jell-O Shots! 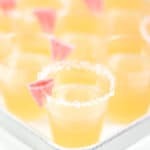 A favorite cocktail turned Jell-O shot — perfect for summer parties! Prepare molds. (I used the lime shells, but you can also use plastic cups, cupcake wrappers or mini-muffin tins.) Spray them lightly with cooking spray. In a small saucepan over medium heat, combine sugar, water and mint. (For stronger mint flavor, first clap the mint leaves between your hands to release the oils.) Stir until sugar dissolves. Do not boil. Remove from heat. Discard mint leaves. Add the lime juice to a medium bowl. Sprinkle gelatin over top and allow to rest for 5 minutes until gelatin is softened and the liquid’s surface appears slightly wrinkled. Stir the lime-gelatin mixture into the sugar water. Warm over medium heat for 2 to 3 minutes, stirring until gelatin is completely dissolved. Do not let boil. Remove from heat. 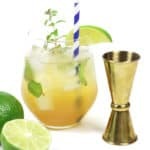 Stir in the rum and 1 or 2 chopped up mint leaves. Distribute the liquid evenly among the molds. Refrigerate 3 to 4 hours before serving. 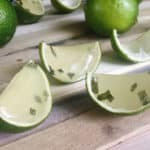 If using lime shells, cut in half to create lime wedges before serving. Pinned!!! I would love it if you would link this up to Tipsy Tuesday at Grey is the New Black. It’s a link up that runs every Tuesday featuring all things alcohol!